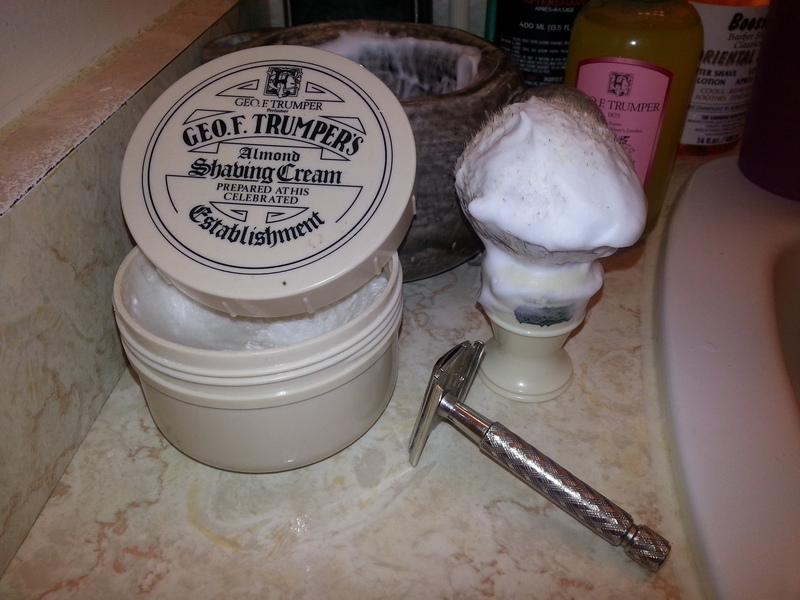 So, I still seem to be experiencing a fair bit of variability in the shave quality of Trumpers creams. This one I found turned out to be a fair chunk better than all the others I’ve tried. I don’t know, maybe they’re all the same and it’s just really fiddly, and I got lucky with the almond. Anyways, I had previously mainly had issues with the lubrication of GFT creams, this wasn’t an issue this time. It needed a fair bit of water, but this didn’t result in unacceptable levels of thinning out, unlike, for example, the violet. The almond scent is a nice one. It’s your classic sweet almond / marzipan scent. It’s a tad on the weak side: nice and strong when you’re sniffing the cream itself, or the brush after lathering, but it doesn’t carry over very strongly when applied to the face. So, overall, I’d say it’s a 7/10. A bit stronger on the scent could have bumped it up. Cost: The 200g pot shown is $29.95, or you can get a 75 g travel tube for $17.95.